Producer & Narrator - Walter Pym,writer Ron Ingleby. 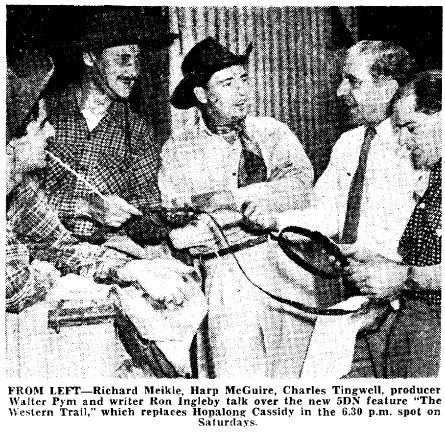 Cast: Charles (Bud) Tingwell, Harp McGuire, Richard Meikle. The job of a lumberjack to clear a path through a forest for the railway offers a good safe cover to an outlaw on the run. A report comes through to some local forest rangers that such an outlaw bandit is heading in their direction. Danny Trevor and his father set up a general store in the growing town of Sweetwater. Business is good and Danny decides to leave his father and see a bit of the country. After wandering for years, he returns to find his father in ill-health and owing money to the bank. Every day in Provo, Utah there was a crop of robberies, shootings and murders and they just didn't seem to stop. A handful of law-abiding citizens banded together to sack the sheriff and judge of Provo and bring in strangers to clean up the town. In 1987, the sheriff of Canyon City, Ace La rue, had the reputation of being the fastest draw in all the West. He had twelve dead gunmen to his credit and so big did his reputation grow that the people of Canyon City laid bets as to who would survive the gunfights that the sheriff was regularly in. When General Custer's troops are wiped out by the Sioux Indians who are on the warpath after being forced off their reservation in a remote part of Wyoming badlands are in grave danger. They recieve amessgae telling them to leave their outpost immediately but circumstances prevent them doing so. Captain John Sudders, a Swiss migrant, drifted into Mexico in 1839 to settle there. Granted land he set out to farm it, and, by accident discovered gold. The attempts of this man to quell the gold fever he knew would arise, makes resting listening.